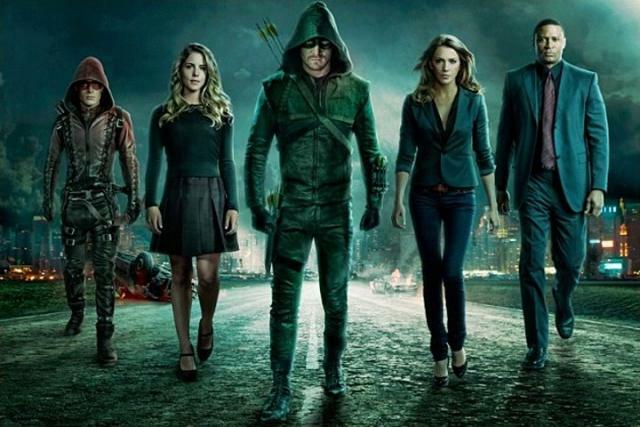 Following the appalling cliffhanger that Arrow used to wrap up 2014, I was eagerly awaiting the show’s return. I’ve been a bigger Flash fan than Arrow this season but with both hiatus’ I found myself anticipating Arrow’s return more than Flash’s. We would get to see the aftermath of a game-changing cliffhanger (no pun intended) instead of just catching up with the cast of the show. Thankfully, I can say with great joy that my expectations were met this week by an episode that ranks itself among the best of Arrow’s wobbly third season (while even outclassing this week’s Flash). To be perfectly candid, I was simply excited to feel Oliver’s absence throughout this episode. Seeing how each supporting character would react and watching the show without its main presence. I’m always intrigued by a drastic shift in a status quo that isn’t a gimmick. And while Oliver is resurrected by the end of this episode, I don’t think his death was gimmicky at all. It’s a clever way to up the stakes of a show that has aimed so high, it’s likely impossible to continue upping them. It makes perfect sense to remove the driving force of this series for a brief series of episodes. The supporting players are facing the greatest challenge they’ll ever face. Crime that isn’t subdued by Oliver Queen. It was evident to me that Roy, Diggle and Felicity were slightly incompetent in their crime fighting. Roy and Diggle (who donned the Arrow costume) needed to take matters into their own hands to protect the city. It was great to see their instability as a team without their leader. Diggle and Roy remained emotionally intact while dealing with the loss of their mentor and friend. Diggle shared an especially strong moment with Felicity as he revealed that he still feels like Oliver’s bodyguard and he wasn’t able to protect him. I’m hoping that Diggle is given more focus now that Oliver is out of the spotlight. As for Felicity, she was the unstable part of the group here. She had to deal with the loss of someone she loves and she obviously didn’t handle it too well. A sudden outburst with Ray showed just how innocent she actually is, and watching her hopeful spirit collapse throughout the episode was quite sad. I’ve seen a few comments stating that she was whinny and annoying but to me, she felt like the human element of the episode. Rather than being stoic, she was emotional and overall more relatable than the other characters. Though at times her state of denial could certainly irritate some viewers the way Laurel has in past seasons. This is a little weird to say but I actually liked Laurel more in this episode than I did Felicity. Despite an implausible courtroom scene, Laurel’s minor role proved to be a strong one. In contrast to Felicity’s sorrow response to the loss of her loved one, Laurel just responded with belief that Oliver would return like in the past. Finally, she came into her own as a vigilante when the notion of his death becomes real. It’s been building for a while and I couldn’t see a better opportunity for Laurel to pick up her sister’s mantle. I’m eager to see how she does in her first outing as the Black Canary. The flashback scenes this week were actually pretty strong. Although, I do feel slightly cheated seeing Oliver in this episode before his resurrection. We were given a cool heist story in which Ollie proved his efficiency to the callous Amanda Waller and merited his new life in the form of a life-debt. The action was very strong here but I’m beginning to question whether the Flashback scenes are truly necessary at this point. They were incredible in season 1 and proved to be a hindrance to the main plot in season 2. Here, while being enjoyable they just feel like they’re included out of necessity. Something that I’ve never really appreciated about this show was the directing. Sure, it’s has some good directors and some well shot action but nothing that caught my eye as much as this mid-season premiere. Glenn Winter did a fantastic job shooting this episode, using longer takes and a lot of cleverly circular shots. The action sequences were exciting not only due to the uncertainty of the situations but also because Winter knows how to compose a well-rounded shot. The only real flaw I had with this episode was the use of Malcom Merlyn. He’s a great character and his guilt over Oliver’s death was a lucid expression of his genuine care for Oliver and belief he would succeed. However, he seemed to just pop into a scene talk about Oliver’s death and leave. His poor job of searching for Oliver’s body made me question the timeline of this episode. Where is the League’s hideout? They make it seem far away from Starling but Malcom seemed to go back and forth in about a day. It all felt weird to me. On the other side of the villain material, Vinnie Jones made his debut as the commanding crime-boss, Brick. Finally, the Arrow crew seem to have gotten rid of the vapid one-shot villains that immensely detracted from this show in the past. From his first shot, Brick is established as a vicious leader with ambitious goals. I loved his challenge for the people he got into conflict with. Giving them a gun and telling them if they kill him they can walk free. This added a supernatural element to the character who survived a gun-shot to the head from Diggle. And best of all, he’ll continue to appear in following episodes. Arrow season 3 has been quite inconsistent. At times, it rises to the highest quality of season 2 and others, it drops the lows of season 1. I’m glad to say that this new storyline has made me quite optimistic that the latter half of season 3 will be another high point for this series. The story feels more focused than the first half of the season and with the threat of Ra’s Al Ghul looming, Arrow couldn’t be in a better place for delivering a satisfying third year.